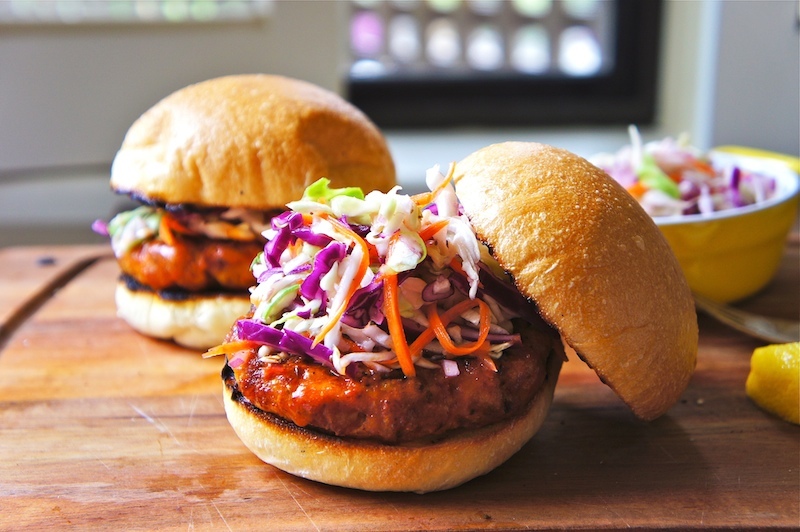 This Buffalo Chicken Burger is a healthy change from the usual beef burgers. Do try making this spicy burger, top it with some of the Sweet and Tangy Coleslaw. Enjoy! In a large bowl, mix the ground chicken with garlic powder, red onion, Italian seasoning, chili flakes, breadcrumbs, sea salt, olive oil, and some freshly ground black pepper. Divide into 6 equal patties and refrigerate for about 2 hours. Melt the butter and mix in the hot sauce. Let it simmer for 2 to 3 minutes. Pour half of the sauce into a lightly oil baking tray. Prepare the grill or a large cast iron pan over high heat. Grill the patties for 3 minutes on each side and transfer into the baking tray. Then pour the other half of the hot sauce on the patties and bake for about 6 minutes on each side. Remove from the oven and brush with some of the hot sauce and place the patties on lightly toasted buns and top with some sweet and tangy coleslaw. boy are these burgers making me hungry! I don't know why i've never made chicken burgers at home but this sure looks like a good place to start! Yum! Reading about this buffalo chicken burger is making me hungry! Love the combination of flavours! Look's delish!! Now where's the recipe for the sweet and tangy coleslaw? These are on the menu for next week...they look awesome! I know this post is old, but I wanted to tell you that I have made these burgers about twice a month for the past year or so. I mix up the recipe here and there, but you started it all. Thanks!